I want to capture my musical ideas, record and edit and finish songs… what should I do? I’m always figuring out better ways to write songs… I checked into research about handwriting vs typing but the results were uninspiring! How do I write songs faster? How do I catch my lyric ideas at the speed of thought? As I create ideas, through improvisation, imagination… how do I remember the musical ideas… play with patterns until I complete a song? … while creating the best songs possible! What if my songs get stuck because of my songwriting workflow? What if my songs are stuck because of how I write songs? What if I’m writing the wrong way? What if I’m doing it all wrong? If you have trouble coming up with song ideas, read this first: Songwriting Inspiration: What Do I Write My Song About? What’s The Best Storage Medium For Song And Lyric Ideas? After failing to find supporting research for all of the articles about handwriting is better than typing, I decided to dig into my own songwriting for answers. To capture lyric ideas in a format that is useful for remembering and editing, I evaluated these four methods for their advantages and disadvantages. After the analysis, there are action steps to help you improve your songwriting workflow. Handwriting is the easiest for me to get into a flow and stay there while I write. Handwriting feels slow compared to typing. After handwriting, I still end up typing, even if it’s not until the final draft. I usually type the final draft, but many songwriters use software and apps instead of pen and paper. You need a device (that you probably already own), whether a laptop, desktop, tablet or smartphone. Optional: printer. I find it hard to ignore typos… I feel I must correct them immediately which breaks my flow. You can record your musical ideas directly into a DAW (digital audio workstation) or use an app on your phone to record a rough guitar and vocal demo. Create according to your skills with performing and singing, recording, mixing and mastering… take it as far as you want to…. This is more gear intensive. You can get started with GarageBand on an iPad or iPhone. Add a guitar interface, midi interface and a better microphone when you can. If you’re freestyling it can take a long time to review the recording and then transcribe the words and then edit them. When you are singing into a computer DAW it can be slow or awkward to record several takes and then figure out which to keep. The ideas start in my brain, why not keep them there while I work on them? When I learn to do this properly I’ll never have to write anything down again… no more grocery lists! This is a tough one for me: I don’t trust my memory for song lyrics. I’ve forgotten song lyrics on stage, even to songs I’ve written. I need to spend time practicing to perform from memory I don’t forget what I’ve “written”. It’s hard to keep long sections in my head. How do you hold ideas so you can work on them at another time? And how can you finish more songs that you start? work on your songs every day! Where are you strongest with the four workflows above? What are the easiest ways you could improve your workflow, considering your strengths? Where are you weakest with the four workflows above? What skills do you need to build to improve your songwriting workflow, considering your present weaknesses? Typically, I write lyrics first. Writing music is very fast for me, so I intentionally work out the story of the song and most of the lyrics before I add music. I choose a chord progression and find the melody from the rhythms and accent patterns in the lyrics. After considering everything, I intend to spend more time working things out in my head. Instead of completing a “final” draft of the lyrics, I’ll start setting lyrics to a melody and chord progression sooner. Instead of fussing over word choice, I’ll make more lyric decisions by singing along with the song… and creating in context with the music. And I’m continuing to explore ways to memorize lyrics and music, so I don’t feel dependent on lyric sheets… this includes handwriting the lyrics, spending time creating associations (emotional and visual) with the lyrics to help me remember words, practicing songs without looking at the lyrics. Here’s a great way to learn and memorize songs: The Fastest Way to Memorize Songs. 2. Decide where you could improve your workflow as you start your next song, or with the song you’re already working on…. Where do your songs usually get stuck? What songwriting results do you want, that you aren’t already getting? Where can you be faster or more efficient? What do you need help with, that you can’t do for yourself? 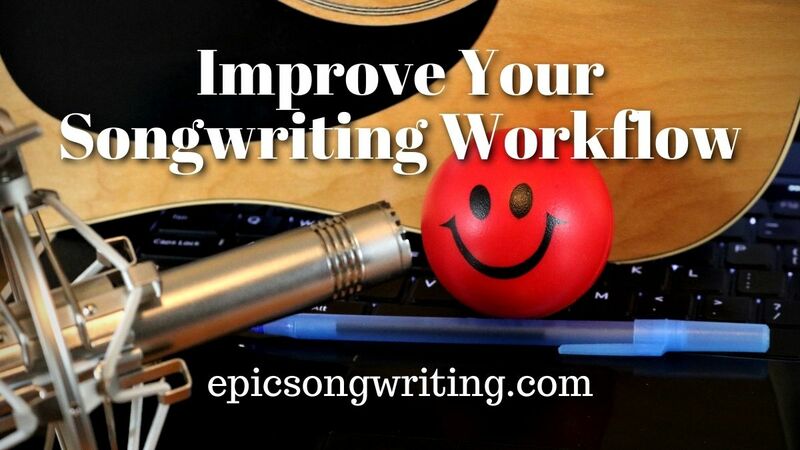 How can you improve your songwriting workflow? What other workflows would you add to these four? 0 responses on "Improve Your Songwriting Workflow"